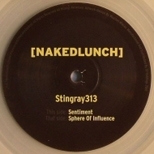 Those familiar with the work of the mysterious Sherard Ingram will lap up the sub-aqua electro bass of 'Sphere Of Influence', but the former Drexciya DJ departs into another netherworld for 'Sentiment'. Underpinned by a recoiling acid line, Ingram's dynamic bass workout also features thundering Chicago claps and a soulful female vocal. Like the missing link between Workshop and UK bass, 'Sentiment' sees Ingram diving to a new level.